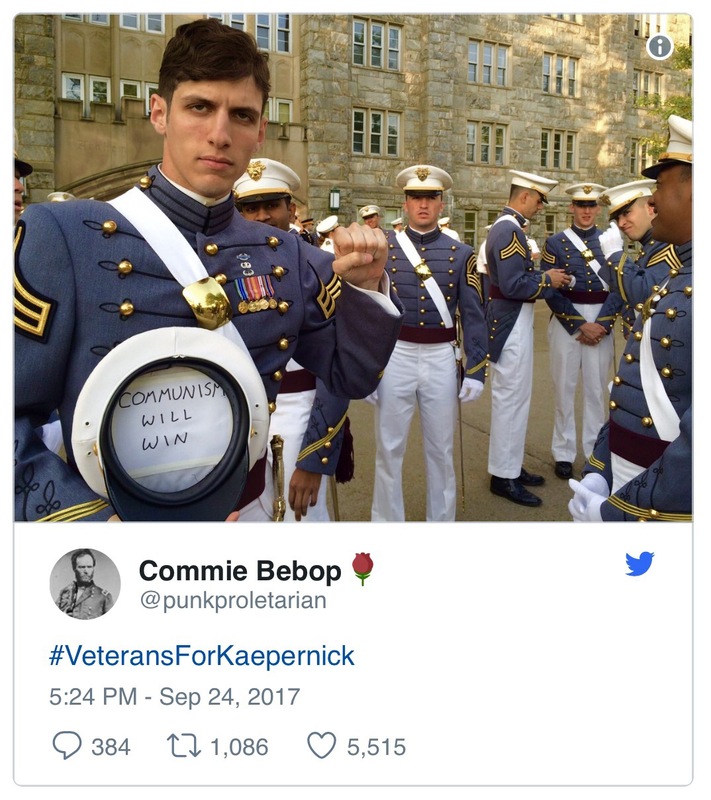 The Tweet shows Spenser Rapone with a tight raised fist, commonly used by neo-Marxist movements such as “Occupy Wall Street,” “Black Lives Matter,” “Antifa,” and other radical groups, as he stands with other officers. Spenser Rapone’s Twitter account @punkproletarian; his profile features a Soviet hammer and sickle flag and a profile picture of William Tecumseh Sherman. Via LawNewz, Rapone is a graduate of West Point Military Academy (WPMA) and belongs to the Democratic Socialists of America. “Democratic socialism,” of course, is another word for neo-Marxism, regularly deployed by neo-Marxists such as Sen. Bernie Sanders (I-VT) and the United Kingdom’s Labour Party leader Jeremy Corbyn. We have been saying for years that radical members of different anti-American factions have infiltrated our ranks and our highest levels of Military and Government. We have come to a point in our Country where they are not even hiding it anymore!. What will be next, our very own soldiers waving ISIS Flags?. This is unacceptable and must be stopped now. These traitors must be found and purged from our Country immediately before more damage is done!.